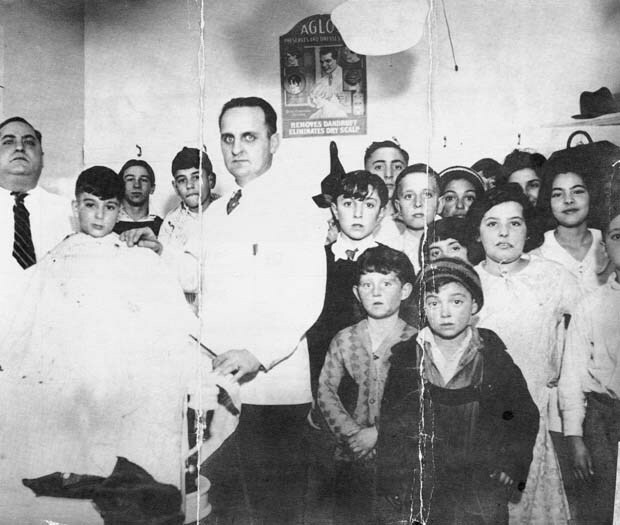 "Barbers Jim Giuliano, Concetto Giuliano and Carl Swim offered free haircuts to local boys and girls at the Water Street barber shop during the Depression. The shop was located at the corner of Wakefield Avenue and Water Street and was adjacent to the Giuliano's family-owned restaurant, Connie's Restaurant. Among the families who are represented in the photo along with Mary and Antoinette Giuliano are the DeFelice, Casey, Croce, Longo families, among others who still remain in Wakefield." -- Text from calendar by Jayne M. D'Onofrio. Photo courtesy of the Giuliano family. “Giuliano's Barber Shop, circa 1929,” NOBLE Digital Heritage, accessed April 20, 2019, https://digitalheritage.noblenet.org/noble/items/show/6957.